Keynote Speech by H.E. 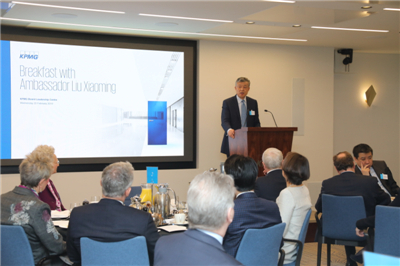 Ambassador Liu Xiaoming at the KPMG Breakfast Meeting: The Chinese Economy: What has changed and what has not? Yesterday was the Lantern Festival. On this day, the Chinese families would all come out of their houses to mark the last day of the Chinese New Year celebration with lantern display and fun fair, and get ready for back-to-work day. 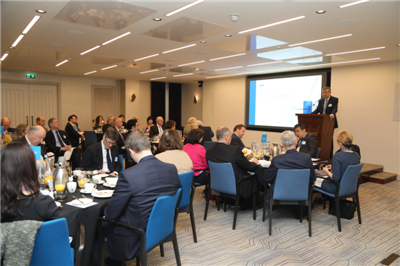 So, on the first day of work according to the Chinese lunar calendar, may I say it is such a delight to join you at the KPMG for this breakfast meeting to mark the beginning of a whole year’s work and to exchange views with you on the Chinese economy. The Chinese economy has been a hot topic lately. David asked me to share my thoughts. So I did some homework and summarized what has changed, and what has not, in the Chinese economy. First, China’s external economic environment has changed, but the long-term growth momentum of the Chinese economy has not. China-US trade friction is also gradually taking its toll. And given the size of the Chinese economy, that is, nearly $14 trillion, this growth rate was indeed amazing. In the long run, China has the confidence and capability to make sure its economy will grow within the anticipated range. After 70 years since the founding of New China, especially after more than 40 years of reform and opening up, the Chinese economy has built up a solid foundation, which will ensure the strong resilience and stability in its future growth. Second, market entities and growth engines have changed, but the direction of economic restructuring and upgrading has not. As China pursues innovation-driven development, new industries, new products and new business models have flourished. In 2018, the output of new energy vehicles grew by 40.1%, optical fiber by 23% and smart television by 18.7%. Newly-registered companies totaled 6.7 million last year. That was a 10.3% increase over the previous year, and it means that on average 18,400 companies were registered every day. New technologies, such as digital economy, e-commerce, modern supply chain and network financing, have achieved an integrated development. Platform economy, sharing economy and smart economy are flourishing. At the same time, the Chinese economy is shifting from high-speed growth to high-quality growth, and the economic structure is optimising. In 2018, final consumption expenditure contributed 76.2% of economic growth; tertiary industry contributed 59.7%; and the value-added of the high-tech manufacturing industries accounted for 13.9% of the total increase of the industrial enterprises above the designated size, which was 1.2 percentage points higher than that of the previous year. China is also stepping up energy conservation and emission reduction. We are working on a green economy. In 2018, energy consumption per unit GDP decreased by 3.1%; and the share of clean energy in total energy consumption increased by 1.3%. Moreover, China has steadied the macro-economic leverage ratio and kept the debt level under control. By the end of 2018, domestic assets of China’s banking sector had totaled 261.4 trillion RMB yuan, with the ratio of non-performing loans standing at only 1.89%. Third, the intensity and measures of reform have changed, but China’s determination to stay open has not. We will put in place carefully measured macro regulation and control, and rely on market rules and rule of law. We will focus on invigorating micro-entities by giving enterprises and entrepreneurs the initiative. This will be achieved by giving them positive incentives and encouraging market competition. We will work on better circulation in our national economy, build a unified and open modern market system with orderly competition, and improve financial services. Through these efforts, we will enable a virtuous cycle between domestic market and producers, between economic growth and employment expansion, and between the financial sector and the real economy. Amidst all these efforts, China is committed to the basic national policy of opening up. We have adopted a number of measures to increase market access and promote investment liberalisation and facilitation. In 2018, China successfully hosted the first International Import Expo, and brought down average tariff from 9.8% to 7.5%. According to World Bank report Doing Business 2019, China ranks the 46th out of 190 economies in the ease of doing business, moving up by 32 places than the previous year. The following figures show how this was achieved. Despite a steep 19% drop in global FDI, foreign investment flowing into China totaled $135 billion, increasing by 3%. Newly-set-up foreign businesses in China topped 60,000, increasing by 69.8%. Of all these, British investment in China soared by 150.1%. With its concrete actions, China has demonstrated to the world its determination to support trade liberalisation and open its market. Fourth, China’s role in the global governance has changed, but its resolve to share benefits with the world has not. China cannot achieve development in isolation from the world, and the world needs China in realising global prosperity. In recent years, China has played an active role in global governance. At the G20 summit, APEC Economic Leaders’ meeting and BRICS summit, China has stood up against protectionism and unilateralism, upheld the rule-based multilateral free trade system firmly, and proposed China’s plans and solutions. These have been important in making sure that multilateral dialogues focus on inclusive development and win-win cooperation. China has also taken concrete actions in this respect. China has been the largest contributor to world economic growth for many years in a row. In 2018, China accounted for nearly 30% of world economic growth. With huge consumer potential and investment opportunities, China has also created a large amount of jobs for the world. Take the Belt and Road Initiative for example. BRI has become a public good for the whole world by allowing all participating parties to benefit from China’s development. By the end of 2018, China had invested $28.9 billion in countries along the BRI routes, paid $2 billion in tax to host countries and created 244,000 jobs for the local communities. Looking ahead, I am confident that the Chinese economy, as the most important growth engine in the world, will maintain robust development and play an indispensable role in global economic growth. This year marks the 65th anniversary of the establishment of China-UK diplomatic relationship at the level of chargé d’affaires. Over the past 65 years, China and the UK have achieved fruitful results in our cooperation across the board, thanks to the concerted efforts of both sides. There have been numerous highlights in our economic, trade, investment and financial cooperation. However, as we all know, China-UK relations encountered some setbacks last year. In order to cherish the hard-won momentum in the relations and keep to the direction of the “Golden Era”, both China and the UK should resist interruptions and bring the bilateral relations back on track at an early date. First, you could find opportunities in forging a strong link between China and the UK based on our industrial and policy synergy. Both China and the UK support free trade and an open economy. It is important that we work together to uphold open cooperation, safeguard the open economy, oppose protectionism of all forms and foster a fair, transparent and non-discriminatory business environment for the companies of our two countries. China is lifting and easing restrictions on foreign ownership in joint venture firms in sectors such as banking, insurance, securities, auto manufacturing and ship building. This has created more favourable conditions for our two countries to deepen business cooperation. This year, China will host the second International Import Expo. We welcome British companies to the Expo and hope you will bring more British products and services to the Chinese market. Second, you could find opportunities in building a platform for cooperation on the Belt and Road Initiative. Thanks to BRI development, countries along the routes have enhanced trade, tapped investment potential and benefited from major projects. In 2019, China will host the second Belt and Road Forum for International Cooperation. We look forward to working together with global partners to ensure that BRI development is of higher quality, up to a higher standard and at a higher level. According to a recent report, BRI will add $117 billion to global trade this year, including $61 billion worth of imports by China from about 80 countries. 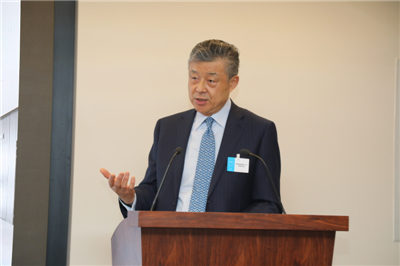 BRI promises great potential for China-UK cooperation. I read and appreciated the two reports on BRI issued by the KPMG. I look forward to more suggestions and ideas from you in the new year. Third, you could find opportunities in the innovations brought about by the new round of scientific and technological revolution. This round of scientific revolution, and the industrial transformation that comes with it, is all dimensional. Its impact on the production model, lifestyle and value will be profound. To keep up with this trend, we should take prompt actions to stimulate the innovation potential, invigorate the market, and enhance international exchanges and cooperation on innovation. We must get ready to take on our respective and common challenges in the future development of our countries. In April this year, the 17th China International Talent Exchange Conference will be held in Shenzhen. The UK will be the only “country of honour”. I am sure this event will give a fresh boost to China-UK cooperation on innovation and talent exchange. Entrepreneurs are an important force leading economic growth and riding the waves of globalisation. 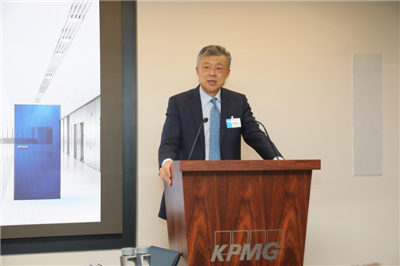 In 2005, the KPMG established the China Desk and has since expanded its business in China and made positive contribution to China-UK relations and mutually beneficial cooperation. I sincerely hope that, in the new year, the business communities of our two countries will join hands to seize the opportunities and deepen cooperation. Together, you could make greater contribution to the steady and sustained development of the China-UK “Golden Era”!